In this book, Walter Scheidel displays an overwhelming grasp of history, his field of study. His conclusion is that wealth, income, and status inequalities have always been with us, and they won’t go away because they never have. Extreme inequality is stable because the haves have the upper hand maintaining their positions until a catastrophe bigger than them drives them from their perches. By catastrophe, Scheidel means a fatal hit to the upper crust: The Germanic tribes finally driving the corrupt senate of Rome into oblivion. The bubonic plague wiping out half the population of Europe. The World Wars and Communist revolutions of the 20thcentury driving the nails in the coffin of royal feudalism and erasing inherited fortunes with trillions of dollars in physical destruction and indebtedness. That is, total collapse of an old elite always required death, violence, or both. Throughout history and until now, Scheidel concludes that more big fortunes and dynasties are built by political dominance and preying on other people than are built on creating new value. The haves like this status quo. New upstarts create something new. They also create inequality. Enforcing strict equality, as in Mao’s Red China, requires violence to suppress self-motivation, and it’s unstable. Extreme inequality is stagnant, but stable because it’s also maintained by violence as needed. Desired is moderate inequality that gives people a degree of control over themselves and an incentive to care for their community, but it’s a hard condition to maintain over time. At the end, Scheidel identifies social policies that help keep inequality compressed: trade unions, education, progressive taxation, high estate taxes, worker rights, minimum wages above subsistence level, forgiveness of debt, and perhaps even a guaranteed basic income. But over a long haul none of these are apt to keep inequality from advancing. They haven’t in the United States. Mass mobilization warfare – huge fractions of the population involved or displaced. Transformative revolution – usually bloody and extended. State failure – ex. old monarchies couldn’t cope with modernity or financial crises. Pandemics like the bubonic plague killing a big swath of the population. Sometimes all the horsemen were pulling at once, as during the global transformation from 1914 until roughly 1950. Scheidel analyzes a broad sweep of human history to form a few general conclusions, but his analysis centers on wealth and income inequalities. You can look at history from many angles, and this is but one. Finding data that fits a broad sweep of history is no small feat. Much of the record is fragmentary and inconsistent over time. Scheidel is very aware of this. He makes extensive use of Gini coefficients, and of approximations to them, but opens with a disclaimer: none of the data are precise. 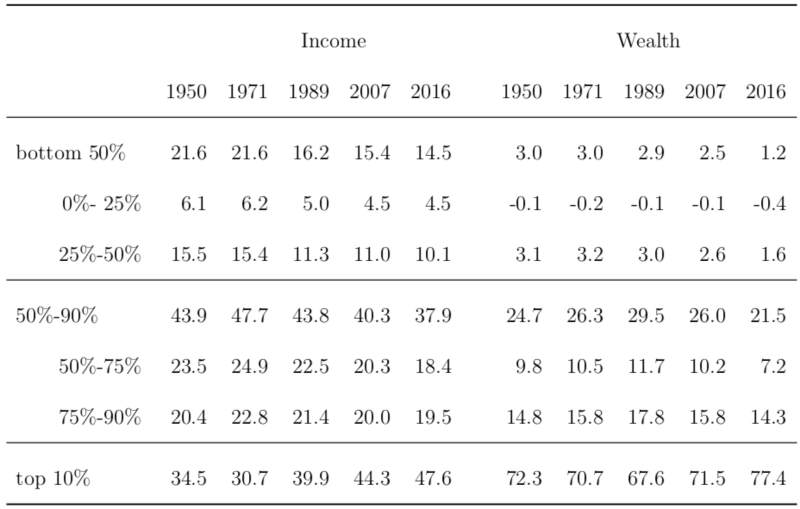 One can only infer whether wealth inequality is increasing or decreasing. Of such disputation there is no end. Since we constantly compare ourselves with ourselves, such argument is the bedrock of economic political gridlock. Measuring differences with money obfuscates as much as it reveals. It can’t tell you whether the stress of living near bankruptcy is greater now than in 1950. Gridlock will end when something forces us to end it. Of personal interest to this reviewer was Scheidel’s summary of the history of Japan through WWII and its aftermath. Inequality almost certainly rose from 1854 until 1937 when Japan’s military invasions of China and Indo-China began to stress its economy. Conscription boosted the number of men at arms to 8 million, a big cut in the workforce running the home economy. In 1938, the government capped executive pay. Taxes rose, especially on the wealthy (there wasn’t enough blood in the commoners’ turnips). Rents were fixed; between 1941 and 1945, rent as a percent of GNP shrank from 4.5% to 0.3%. Rationing was instituted. At the same time that the government took over the economy, it instituted state-run health systems and welfare systems. This takeover planted the idea that a company should be a communal organization benefitting the common good (war patriotism) than a profit maker for ownership. Profit sharing began. Allocation by need forced the custom of paying wages based on age, needs, prices, and inflation. To represent the workers, union membership rose from 10% in 1939 to 60% in 1949, but most unions were what we would call company unions. After the war McArthur and the occupation forces were determined to make the upper class responsible for the war pay for that mistake. They finished leveling the distribution of wealth and income. From 1946 to 1951, regressive property taxes were confiscatory. From 1937-1948, the percentage of national income represented by dividends, interest, and rent shriveled from 45.9% to 0.3%. Farmland was confiscated from big landowners and given to the owner operators. By 1950 McArthur had wiped out the top 1%, and everyone else was beaten down to almost the same level sharing the misery. For those readers interested in how “lean manufacturing” began and why, deep cultural history was not nearly as big a factor setting the cultural stage for it as Japan’s economic Great Compression during WWII and the occupation. With everybody reduced to nearly equal destitution, there was nowhere to go but up with everybody pushing. Scheidel hardly mentions the global environmental problems now besetting us, threatening old economic systems and social orders. All Great Compressions were local or regional until the debacles of 1914 to 1950. But his work makes it clear that muscling up to global environmental issues is unlikely without violent upheavals. Looks like a great book! I plan to purchase!